I have mentioned before that 2016 was a very difficult year for us, but I know that it was a hard year for people all over the world, and maybe even for you. It's New Years Eve and may I suggest that the time of reflection (lamenting, mourning, whining, complaining) of 2016 is over. It is time to look forward to future – 2017. The world seems to be falling apart around us; politics have the global community on edge, parenting is harder than ever and the crisis of starvation, orphans, poverty and disease don’t seem to be getting any better. So what do we do now? I don’t really have an answer for people who are not followers of Jesus, but for those of you who are, the only answer is to be intentional about asking the Lord for direction in your life, every day. Now more than ever we need to be seeking His will and be obedient. If you are supposed to move, then move. If you are supposed to give, then give. If you are supposed to pray, then pray. If you are supposed to volunteer, then volunteer. Stop waffling and start doing. Today is the day. I hope you will spend more time watching the 20-second video that is attached than you will spend reading this short blog, and that you will be encouraged as you watch. These children are alive and well because many people like you either moved or volunteered or gave or prayed for them. Thank you to each and every one of you for all have you have done to make a difference in the world. Gabriel and Rose celebrated their 6th birthday this week! Live from Swaziland … Happy New Year! Year end giving in Canada – please click here. Year end giving in the US – please click here. 2016 has been a very challenging year on many levels. Devastating drought has made extreme poverty even worse. Death by HIV/AIDS, TB, house fires and fluke accidents have caused us to attend too many funerals. Pain and suffering have become the parents of hopelessness - a hopelessness that I have never seen before. Death seems to be hiding in every bush and standing on every street corner, waiting without mercy to strike. But there is hope. Yesterday we received two babies, a 1-month-old and a 4-month-old and last Friday we also received two babies, a 7-month old and a 2-month old. Each baby with a sadder story than the other. One arrived on HIV medication, three are severely malnourished, one has epileptic seizures that started on the ride home, and one has STI’s on her face, but all have been chosen by God to live with us. We now have 146 children (under the age of 6-years) who call Project Canaan home. 61 children from Emseni Campus and 37 toddlers = a difficult photo with 98 children! As I wrote that last paragraph my chest tightened a bit. This is hard. We have 13 babies under the age of 6-months living at Kuthula Place, all struggling to “catch up” in weight and health. Some literally fighting for their lives. 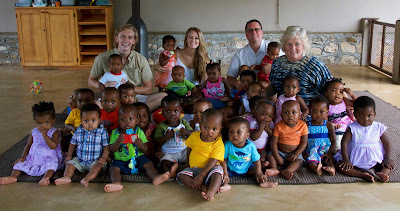 There are 35 children at the El Roi baby home, 37 children at the toddler home and 61 children up at the Emseni Campus. It is overwhelming, at the least. 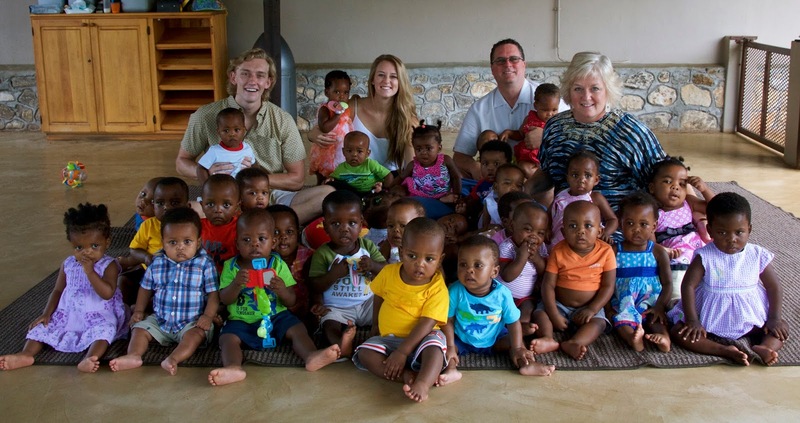 35 children who are 6-18 months old live at the El Roi Baby home. But God is good, all the time, and we give thanks for the opportunity to serve HIM through these small children. 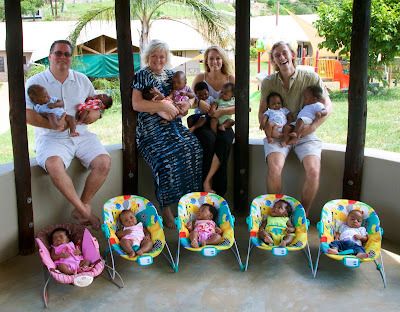 Today there are 13 babies at Kuthula place ages 1-6 months. As the year comes to an end I am writing to ask you to consider making a Year End gift to Heart for Africa. We have donors who will match up to $120,000 and we are really going to need these funds to care for 146+ babies in 2017. Also, we would like to give you an audio copy of my first book "It's Not Okay With Me" for any year end donation, large or small. The book shares our family's journey to Africa. Will you help us with your most generous gift today? Thank you from the bottom of my heart for allowing Him to work through you. Live from Swaziland… Merry Christmas from our family to yours. How important are traditions, really? Spencer and Chloe often tease us that our Christmas tradition is to do something different ever Christmas. Of course I am quick to defend our age old traditions of having Chinese food on Christmas eve, apple turnovers on Christmas morning, turkey with Diane Maxwell’s potatoes Romanoff for dinner and of course the same homemade Christmas cookies ever year. I will admit that when we moved to the US we were no longer able to buy Pillsbury turnovers, so that tradition was forced to change into Ian’s (now famous) Belgian waffles with fresh strawberries and whip cream. There is no way that the kids could complain about that upgrade in tradition, right? Having Chinese food on Christmas Eve was a tradition dating back to my childhood. It all started because there was only one restaurant where I grew up in Northern Ontario and it was a Chinese food restaurant called “The Shamrock”. My mom wanted a quick easy meal at after the pharmacy closed on Christmas Eve before we made the 400-mile drive to my cousins’ house in Southern Ontario. The Chinese food in Swaziland is really not great, so last year our kids suggested that we change the tradition to include their favorite steak dinner, complete with baked potato and Greek salad, rather than Chinese food. That was an easy sell for Ian and me. While the traditions of turkey, potatoes and Christmas cookies have not changed, we have jointly agreed to include making pancakes, bacon and fruit salad for all our big kids and all of the Children’s Campus staff (180+ this year). I believe that this new tradition has become the highlight of Christmas day for everyone in our family. And this year we welcome Spencer’s girlfriend, Jane, to join us in the kitchen, so again, even that new tradition has changed (and gotten better!). Sometimes it is very easy for us to get caught up in having “the perfect Christmas” or holiday for our family. Sticking rigidly to traditions can not only cause unnecessary stress, but also prevent you from new blessings, new freedom and a joy that cannot be explained, but only experienced. While you prepare for your family Christmas celebration, or Hanukah, or whatever ever other festivity that you may be getting ready for, please consider being flexible this year, consider changing it up a bit and don’t forget that it’s the people who are in your “traditional plans” that really matter, not the decorations, or ingredients. Live from Cape Town, South Africa … maybe enjoying a new tradition? PS – In baby news – this past week baby Surprise was reunited with her mother after being with us for several months. Shortly thereafter, a 6-month-old baby boy (Gideon) and yesterday an 8-week-old baby girl (Margaret) joined our family, brining us to 144 children. Please pray for both of these babies as they arrived severely malnourished. Margaret’s mother bled to death during childbirth and she has only been fed thin maize porridge, by her Grandmother, since birth. She currently weighs 2.6 KG (5.7 pounds). I love this amazing team of women and men who care for our babies. This week I experienced something that was so pure and so special, I almost found myself wanting to keep it to myself, tucked deeply in to my heart. But that would be selfish, and so today I share it with you. We have all heard about the attitude of gratitude, but do you really know what it looks like? I do. On Thursday we had the annual Christmas party for our staff at the Children’s Campuses. That’s not as easy as you might think. How do you have a party for the 65 people who care for 143 children (including night shift, cooks, cleaners and drivers) all at the same time? Who looks after the children?? This year we planned the party during the time that 98 of them are supposed to be napping (the toddlers and big kids). We asked long-term volunteers Kenny and Amber VanWinkle and the Harp family to come and sit in the houses where the children slept. Then we recruited our front office women and a few from Khutsala to come and look after the babies while we celebrated Christmas at the back of the baby home (so we were available for emergencies). The event was well planned by our Supervisors and all I had to do was show up (with bags of prizes for our quiz game of course). Homemade/decorated Christmas cookies were handed out and Amber’s peppermint/white chocolate bark was a hit. At the end of the party I told each of them that they would be getting a food gift basket from us including 2L fresh milk, 30 eggs, maize flour, oil, sugar beans, sugar, cabbage, a pair of flip flops and of course, a live chicken. With each item that I pulled out they cheered with glee, as they are all favorites, and very important to their families. And then I made and announcement that brought the house down, and absolutely shocked me. I thought I had seen it all here, but just when I think I have seen it all, I find that I haven’t. I told them that everyone working on Christmas day would earn double pay for that day. Watch these two short videos, and then read on. Don't miss Helen and the live chicken! Double pay means an additional $2.60 to $7.00 - for the whole day. And they were so very grateful, not only for the money, but that we acknowledged their hard work and commitment. It was a moment of true, pure joy, and I am so thankful that I got to experience it. Do you have an attitude of gratitude? I can tell you that after my experience with my wonderful Swazi family, I am looking deeply in to my own heart and doing a bit of clean up in the “thankful attitude” area. The bible says that we are to give thanks in all things. That has been my goal this year, and I will continue to work on it in 2017. 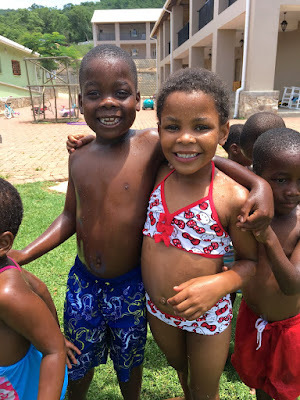 Live from Swaziland … six more sleeps until we see Spencer and 13 until we see Chloe!! PS - It’s been a year since Ian has seen our kids and 11 months since I have. Serving the Lord comes with sacrifices that some days are hard to bear. I am so thankful that they will be home soon! My mom was a lot of things including (but not limited to); brilliant Pharmacist, passionate researcher, loving mother and wife, devoted Christian, exquisite dessert chef and collector of all things. She simply did not have the ability to throw anything out. I mean nothing. Two extremes that I can now share publicly (now that she has passed away) would be finding a drawer full of used wax – the kind that was poured on the top of freshly made jelly to seal it (and then thrown out when the jelly was opened, but not mom’s). And then there was the zip lock bag in the freezer that contained yarn that she planned to use to knit a sweater. The problem that I had with that was that the yarn was made from a collection of fur that she had painstakingly collected over the years … from my childhood CAT, Smokey. I had countless conversations with my parents about cleaning out their basement full of three generations of pharmacy bottles/jars/chemicals/pills/stained glass windows/clocks/piano(s)/ and other stuff from generations of relatives who had died before them. My words fell on deaf ears (literally and figuratively), mostly because my mom was convinced that she would be “raptured” and so all of her “stuff” would be left to “non-believers” who would be “left behind”. My dad passed away in 2005. A few years later my mom was moved to a nursing home, and I was left to deal with the “stuff”. I was angry that they had left the mess for me. I felt that I was trespassing by going in to their home and throwing out dumpster(s) full of garbage, giving away their things and keeping the odd item for myself. But with a lot of help from friends and family, I made it through. After the big clean out in 2010 we shipped a 20ft container of things from mom and dad’s house to Project Canaan. As we unpacked it and distributed mom’s treasures all over the farm I found myself repenting for my anger (over and over again). The Lord knew exactly what those things were going to be used for and He kept them safely in my parent’s home. Last weekend the Christmas tree was put up at the Oasis and our children hung their ornaments on that tree. That was my parents’ Christmas tree. When a child has a birthday and we have visitors join us for cake, the plates that the cake is served on are my mom’s plates. The stained glass window that hangs in the pharmacy at the El Rofi medical clinic was in the front window of my Great Grandfather’s pharmacy at the turn of the century in Uxbridge, Ontario (also found stored in my parent’s basement). Stained glass window from my Great Grandpa's pharmacy circa 1,800's. I am not saying this in any way to be boastful, but rather to share my thoughts on how God works, and to show that I believe that everything that we have, comes from Him. It’s all HIS STUFF, and He will use it as He wishes! Yesterday another container arrived from Canada and while it was mostly filled with diapers, wipes and toys, it also had the last of my mothers treasures. Among them was a beautiful piece of hand carved marble that my parents bought in India, many years ago. 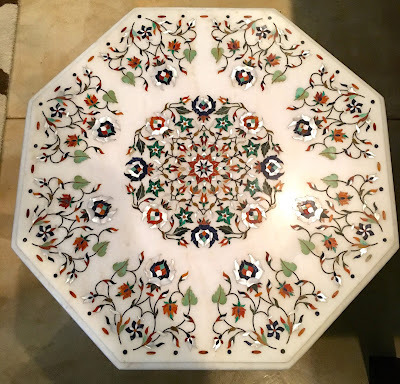 It is inlaid with semi-precious stones, each carved by hand by the very same artisan families who hand-carved the Taj Mahal. My parents had it shipped back from India in the 70’s and then had a table base made for it. It was one of the few pieces of her own furniture that was in her nursing home room. It truly was a treasure (and not to be out of her sight!). Now it is here in Swaziland, Africa, and I am so thankful for it. Another one of her prize possessions also made the trip. Mom’s baby grand piano arrived in the container and will be used for piano lessons for our children (just as it was for me), Christmas concerts and lots of other special occasions. Mom's piano - being moved by our JCB (she may roll over in her grave for this one). As Christmas approaches and I prepare for Spencer and Chloe to come home, I am reminded every where I look at the influence my own parents had on my life, both in life and in their death. Their work ethic, their faith, their commitment to family and their commitment to their community has forever impacted my life, the lives of our children and now, the tiny Kingdom of Swaziland. Christmas is a time when family gathers together, and even with all of my parents “stuff” that now surrounds me, none of it replaces having them here in person. Live from Swaziland … having a “moment”.